If there is one thing that everybody agrees on in poker it is that they want a higher win rate. Having a higher win rate (or big blinds per hundred hands as we refer to it in online poker) simply means that you are more efficient at the tables. It would be like getting paid $30 dollars an hour instead of $20 for instance at your job. All of the sudden your time spent there is simply worth more money. Another added benefit to having a higher win rate is lower variance. The higher your win rate, the less downswings and losing days that you will have. As many know my win rates in past years at the lowest stakes were so high that I would literally almost never have a losing day. This isn't always the case anymore with the games tightening up a bit and recreational players being harder to find. However, with sufficient volume and by following the 7 strategies below I can still come close to that goal. Without a doubt reducing the number of tables that you play is a guaranteed way to boost your win rate. I used to 24 table all the time and switched to playing 8-12 tables just a few years ago. My win rate has at least doubled at all stakes because of this. This is one of the main reasons why I never answer the "what is a good win rate" questions anymore (except for this post that I wrote last year). You simply can't compare the win rate of a 24 table player with an 8 tabler. Or even an 8 tabler with a 1 tabler. They are completely apples and oranges. The bottom line is that if you want your win rate to go up, then play less tables. The old raise preflop, fire on the flop and then fire again on the turn still works surprisingly well at most levels of the micros even in today's games. Some people have clued in for sure and will float you or raise you more often especially by the time you get to NL25. However, there are still tons of regs, especially at the lowest stakes, who will almost always give up versus this line unless they have a very strong hand. Now you don't want to go overboard with this strategy. Many people do use a HUD these days even at stakes as low as NL2 and NL5. If you are CBetting the flop and turn 90% of the time, this is going to stick out like a sore thumb. However, I think that something in the neighborhood of 70% on the flop and 50% on the turn is still very effective. It also isn't high enough to make it look like you are terribly out of line. If you don't get involved in the hand, you can't win. It's that simple. The highest win rates possible in any game are always going to be achieved by the best LAG (loose and aggressive) players. It is really easy to see why this is the case. They are going to win the same amount over the long run with all of their good hands as the tighter players. However, they are also going to be involved in a bunch of other pots with mediocre holdings, which if they can win in some manner, will allow them to tap into a profit stream that tighter players simply do not have access to (because they folded preflop). One of the easiest ways to start opening up your game is actually to follow strategy #1 above and play less tables. Every time I reduce the tables I see so many more +EV situations to get involved in. Please note that this is not the same as getting "bored" and playing a bunch of bad hands in a sub-optimal way like recreational players are prone to do. I am currently working on a huge post about how to open up your game which will probably get released next week. Of course, if you are on my newsletter then you will be notified the instant that it goes live. Wait, you aren't on my free poker newsletter yet? Click here to fix that problem immediately. There is nothing more profitable in all of poker than getting the seat directly to the left of a recreational player. You can isolate the crap out of them preflop and value bet and bluff them non-stop after the flop. These players lose their money at a truly incredible pace and therefore having direct position on them in nearly every single hand is simply rocket fuel for your win rate. There are many ways to get the Jesus seat in today's games. One way that I have spoken about on many occasions is to simply start your own tables. Bad players do not like to wait around for a seat to open up. They have a limited amount of time to play poker and they want to start splashing around right away. You can just immediately rejoin if they happen to Jesus seat you. But an even better strategy than this is to simply observe a bunch of tables that a reg has started and as soon as the fish sits snipe the seat to their left. This and many other strategies on how to locate the fun players and get the right seat against them are included in my ultimate guide to table selection article. When I talk about value betting I am specifically referring to river situations. This street is hugely important to your win rate at all levels of the game. One thing that you should always do before making a decision on the river is check your opponent's WTSD% (went to showdown). Now obviously there are different degrees to these numbers. You should not treat somebody who goes to showdown 18% of the time the same as somebody who goes to showdown 24% of the time. But in my experience you can kind of find a median point with most players at about 25%. Half are above, half are below. The ones who are above are going to look you up lighter and lighter especially as the number approaches the 30's and beyond. And in contrast the players with a WTSD below 25% are going to make more disciplined folds especially the lower the number goes. So if you have a weak hand like middle pair, bottom pair or even ace high versus a 25%+ WTSD opponent you should be asking yourself if there is any value in making a bet on the river. Often you can get a crying call out of some ridiculous holding especially if you pay attention to your bet sizing. As you can probably guess then, versus the players with a 24% or less WTSD we should be looking for opportunities to bluff on the end. One of the most important things to keep in mind with bluffing though is that your story is believable. You decide to fire out a bluff. This is not a very well thought out attempt to win the pot. You are probably going to get snap called by any ace here (and quite possibly some other hands too) because your line represents very little and your hand reeks of a missed flushed draw. If you had instead mixed up your play at some point during the hand though such as check/raising the flop and firing the turn then all of the sudden your bluff here might get a lot more credibility. You might get a tight player to even fold a strong ace with this kind of pressure. Bottom line when bluffing: Do it versus the guys who are capable of making folds (24% or less WTSD). But equally as important is making sure that your line makes sense to your opponent. Make sure that you are clearly representing several hands that beat him. Having a great red line (won money without showdown) is not something that is essential at the micros, especially at the lowest stakes. With many calling stations around it can be difficult to get away with a lot of bluffs. And so many of the biggest winners at NL2, NL5 and even NL10 show negative winnings in this category. However, it is still important at all levels to fight for the pots that nobody seems to want. You will of course be in this situation a lot at the lower limits because you still have plenty of players who think that limping is a good idea. Now it would definitely be a mistake to fight for every pot when you check your big blind with Q2o. However you should certainly be capable of taking stabs at it from time to time when you think that your opponent is weak or making a call if you think they they are bluffing. The same idea applies in most raised pots as well. 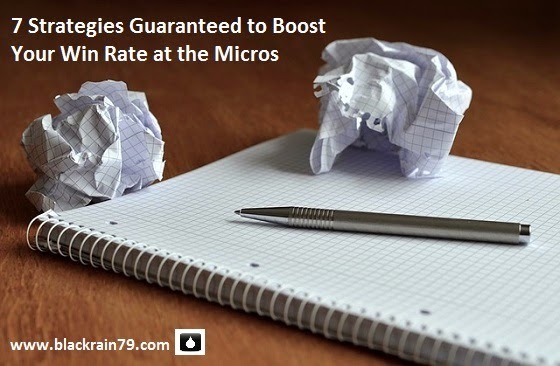 Many regs at the micros these days are notoriously weak on the later streets and you can pick up pots that they have given up on by simply making a bet. On occasion you can also take a crazy line like raising the river because you know that they won't call you with their top pair. The key is not to overdue it or else they might start looking you up light. These are a few of the ways that are guaranteed to boost your win rate in today's games at the micros. None of them are really ground-breaking but you would be surprised at how many regs these days still play way too many tables on auto-pilot for 1bb/100 or 2bb/100. That would be most of them in fact. This doesn't have to be you. Big win rates are still definitely doable at the micros these days. However, you need to cut down on the tables, think outside the box a little more and make sure that you are consistently getting the right seat in the right games. Let me know in the comments below what you think of these 7 strategies. Would you add any new ones or remove any existing ones? If you enjoyed this article please "Like" or "Tweet" it below! Hey Nathan. Keep up the good work you do. I definitely enjoy reading it. I am part of the next gen seat hunter group at the micros. I play 5 tables full ring on stars at NL25 and totally agree on your table selection speeches. Looking in the lobby for new tables to be seated is a great way to snipe that jesus seat. See a short stack player sit down you have not labelled? Or someone with a really odd stack size such as $18.95? Then just sit to their left and enjoy! Having at least one fish always at your tables is good in so many ways. Your speculative calls will be paid off when you flop big and your big hands will be paid off from marginal fishy hands that can't fold. Thanks for the kind words Matt and I agree with everything you said! I also enjoy your archives so I can go back and refresh myself periodically. After noodling and applying I understand them better the second time around. Hi Blackrain, another great post! I do have one query regarding your 'cbet more' point though: I seem to have a higher win rate when I rarely cbet bluff at all. I have a 225k hand sample at 5nl and I lose money when I cbet bluff. I only cbet bluff now when my opponent has a fold vs cbet stat of 75% or more, do you think this is a leak? thanks. Thanks Echo! I think picking and choosing your spots is fine but I would not take it to this extreme. Many regs fold to a CBet too much at these stakes in my experience and you only need them to fold something like 30% of the time to break even mathematically on a 60% of the pot CBet. May you share your recent results? Where do you play now? What stakes? what stakes do you play nowadays, and whats your volume like? do you still make your living primarily from online poker? "But an even better strategy than this is to simply observe a bunch of tables that a reg has started and as soon as the fish sits snipe the seat to their left." great article as always. now its on me to apply your advice to the tables. Thanks Jan, that strategy is indeed golden!